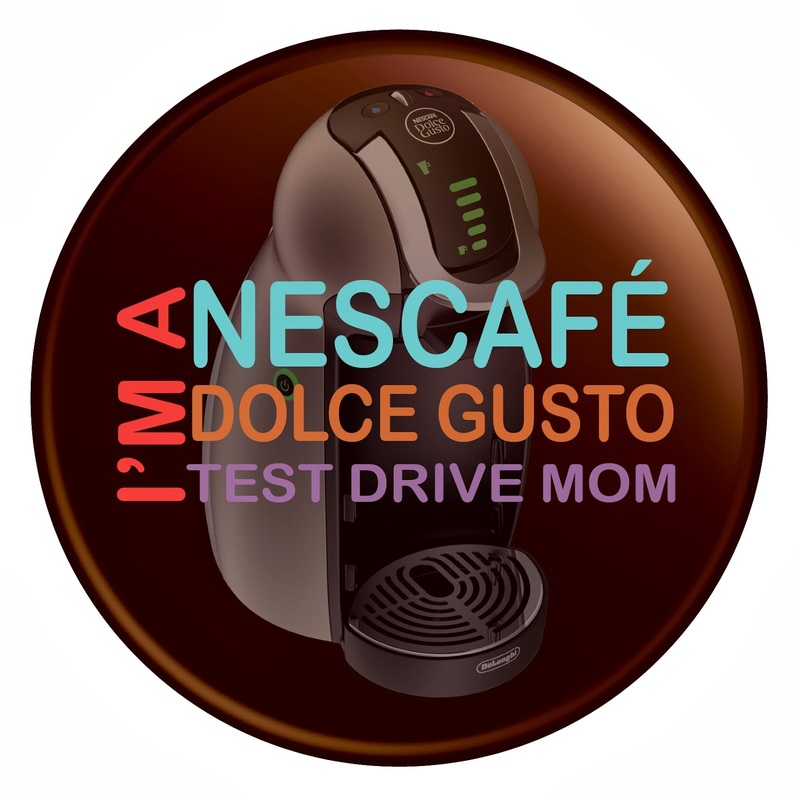 I participated in a campaign on behalf of Mom Central Consulting for NESCAFÉ Dolce Gusto. I received product samples to facilitate my review as well as to thank me for my participation. No matter if your holiday calendar is jam-packed with lavish parties or you're simply getting together casually with some friends to reminisce about the years that have flown by, it's all about spending special moments with our loved ones. It's the season of love and togetherness, right? My calendar falls more into the latter category, as I'm looking forward to spending quality time with my family and friends while we laugh, eat, unwrap a present or two, and just enjoy one another. But I'll admit that there's one thing that can make a gathering even a little better for me, that being a fresh, hot cup of coffee. From the moment that I take my first whiff of the aroma to the taste of the last drop, my coffee manages to take any situation and just make it better. But aside from meeting people at a coffeehouse (and spending a fortune, dealing with lines, and being annoyed by the hassle), how else can I bring coffeehouse quality beverages right into my home? This season and beyond, it's with the sleek and stylish NESCAFÉ Dolce Gusto GENIO. A single-serve coffee machine in the Nestlé family (and manufactured under the De'Longhi name), the NESCAFÉ Dolce Gusto brews an assortment of beverages all conveniently right at home. 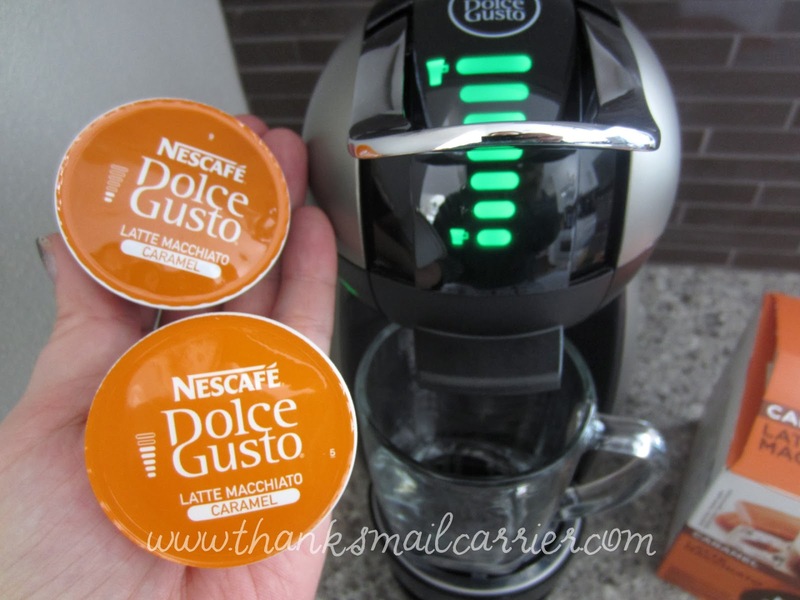 The feature of the NESCAFÉ Dolce Gusto that sets it apart from other single cup brewers, however, is that it is the only machine that truly delivers delicious, coffee house quality creations every time with patented smart capsule technology delivering up to 15 bars of professional pressure and espresso technology. 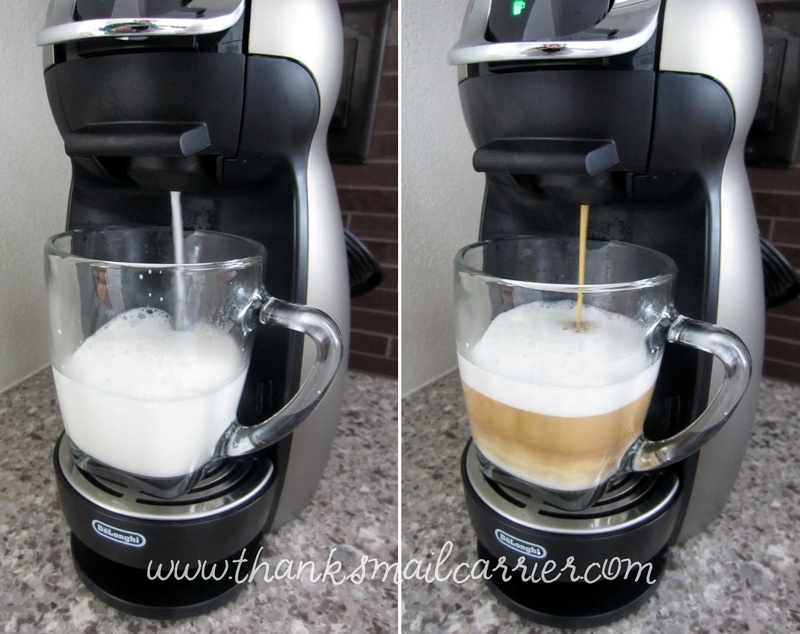 The result is frothy milk and a perfect cup of coffee in under a minute with only the press of a button! 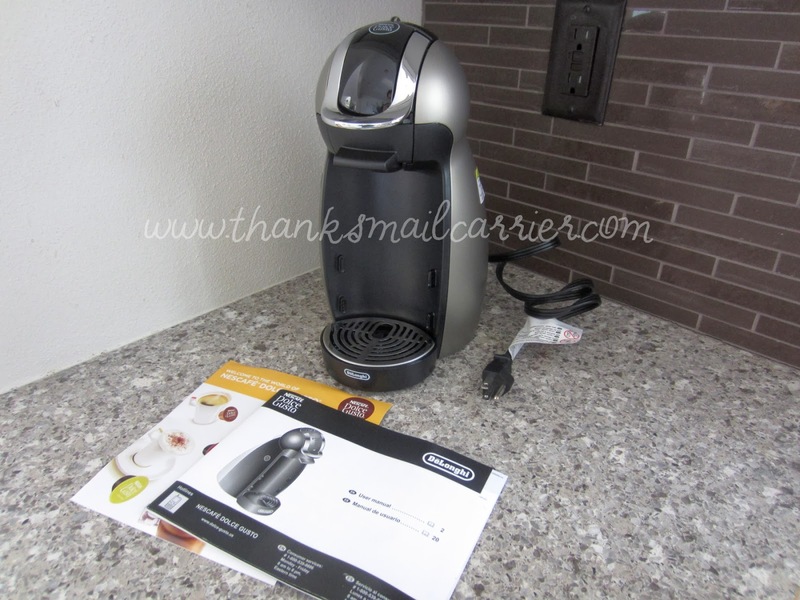 Quick, convenient, compact, high quality and the ability to provide creamy layered lattes, sweet caramel macchiatos, bold espressos, frosty iced cappuccinos, deliciously indulgent chococinos and more to me while I'm still in my pajamas? It was definitely time to test this machine out! 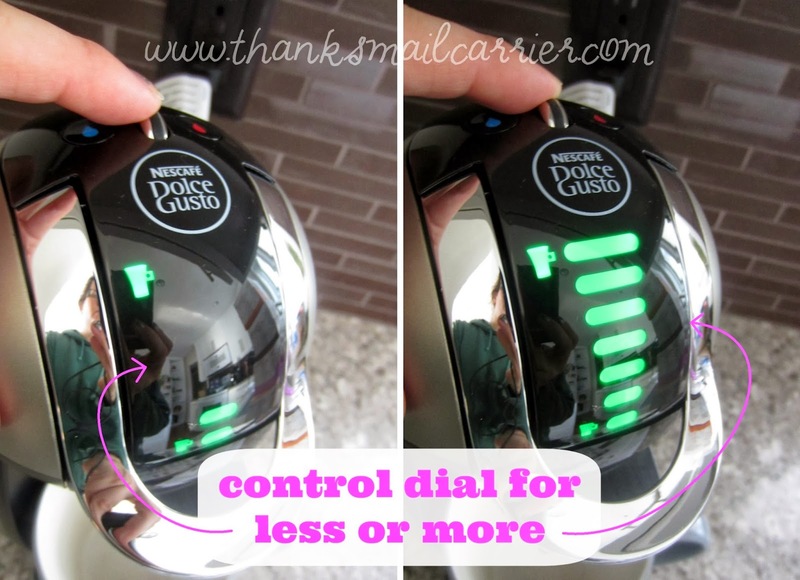 Immediately I was pleased to pull the Dolce Gusto GENIO out of the box and find that there really wasn't much required before I would be sipping my delicious drinks in the comfort of my own home. 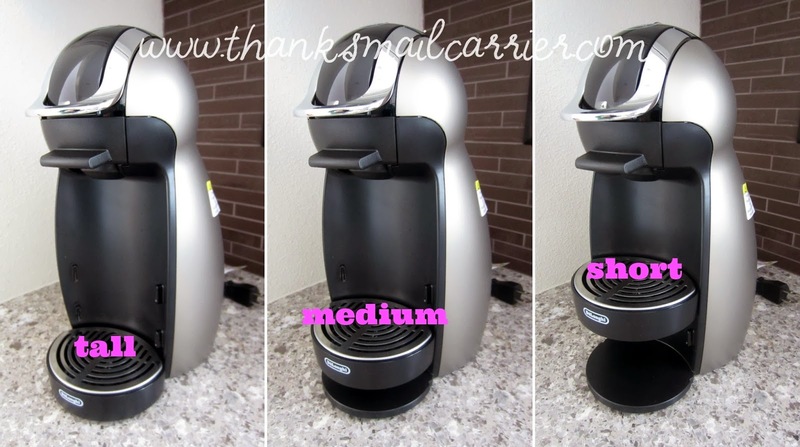 While I had been prepared to see that this is a smaller, more space-saving appliance, I was still surprised to see just how compact it truly is. No matter what the size of your kitchen, none of us want to pile up our counter tops with bulky machines and the GENIO definitely doesn't take up much space! At the same time, I appreciate that Nestlé made it extremely easy to adjust the stand height on this coffeemaker, as you're able to simply move the base to any of the three levels in a matter of seconds. When it comes to brewing your coffee, the NESCAFÉ Dolce Gusto not only makes things easy, but it allows you to customize your final drink as well. First, the exclusive Thermoblock technology heats the water quickly, in turn helping the machine brew quickly. At the same time, the custom control dial lets you decide the strength/size of your coffee drink, so that you can have it exactly the way that you like it (no worries if you aren't sure, as each beverage has a suggested setting printed right on it). All that's left is to decide between the 17 different hot and cold beverages that the Dolce Gusto has to offer! I love that the small, no-mess capsules (filled with 100% Arabica coffee beans) are easily popped into the top of the machine, and the simple press of the hot or cold button gets the brewing underway. In less than a minute, your great cup of coffee (or tea or chococino) is brewed and deliciously waiting for you. Rich and delicious Caramel Latte Macchiato at a fraction of the price and with no wait? Yes, please! 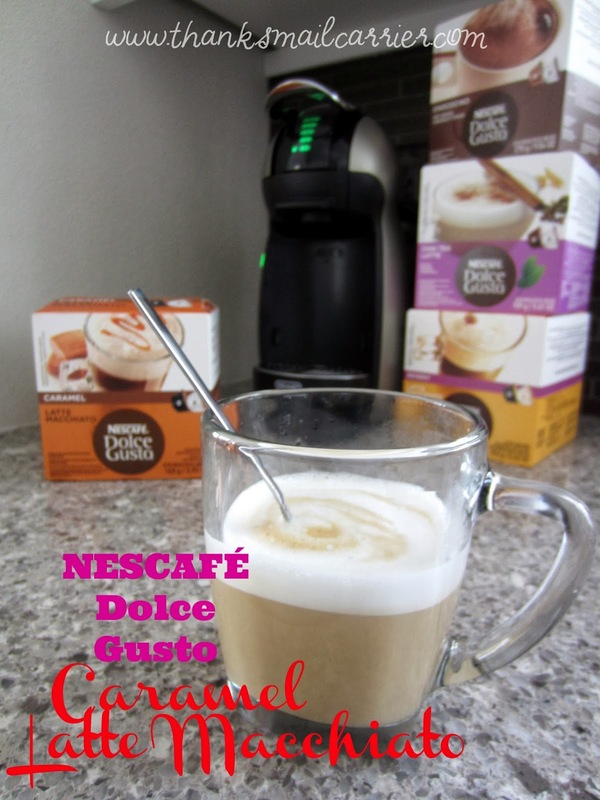 I really love having the ability to offer guests (expected or unexpected) an amazing cup of coffee, tea or hot chocolate this winter without any fuss or wait and that it can be brewed precisely to their liking with the NESCAFÉ Dolce Gusto. This is one machine that works well for the entire family and is perfect for holiday entertaining with its ability to go from one drink to the next without ever compromising taste or quality! 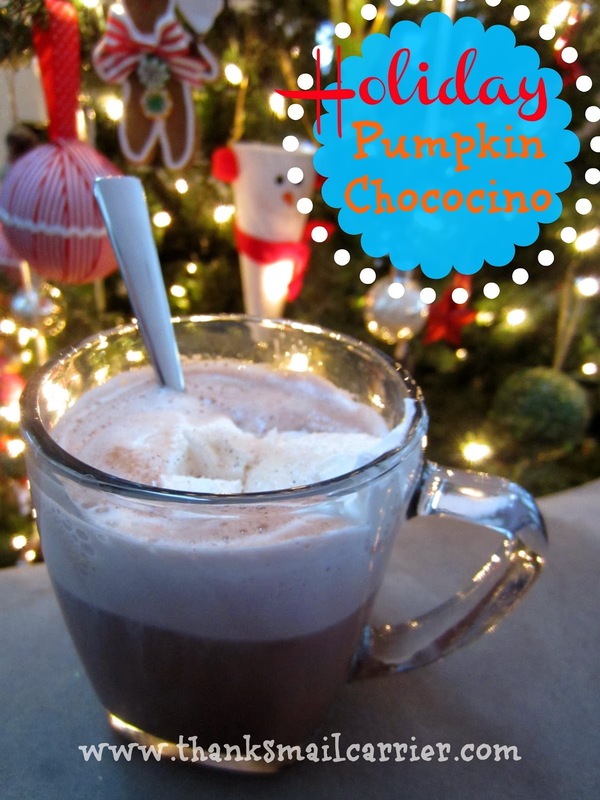 And, don't forget that coffee or hot cocoa doesn't have to be relegated to the standard way that it comes out of the machine (no matter how tasty that may be). The simple addition of a single ingredient might just result in a delicious concoction that you didn't know existed! This holiday season and beyond, let the the NESCAFÉ Dolce Gusto provide a high quality, innovative, fast and easy way to bring efficiency and convenience into your life. The GENIO retails for $129.99 and will surely be an item that will provide happiness throughout the winter and long beyond. 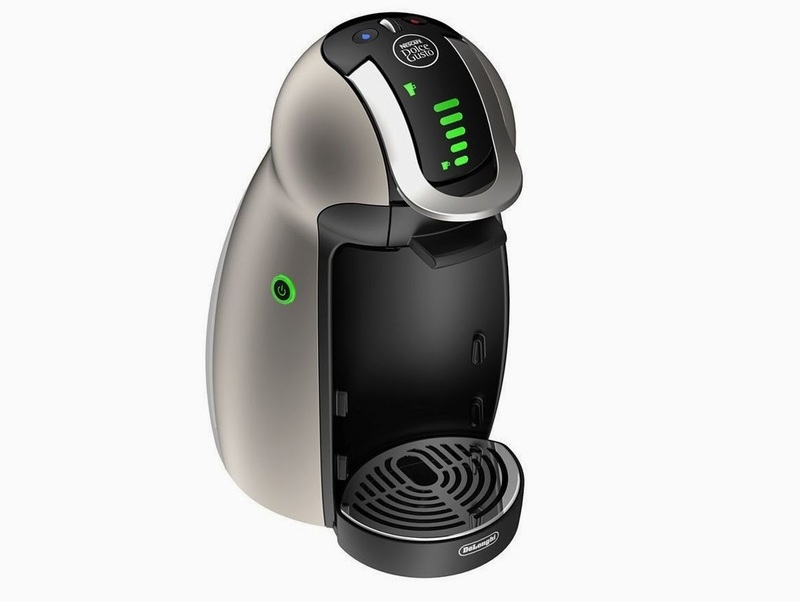 Visit the NESCAFÉ Dolce Gusto website to see their full line of brewers, beverages, accessories and more that can bring a gourmet coffee house into your kitchen or that would make a fantastic gift. Plus, be sure to connect with them on Facebook and Twitter so that you stay up to date on the latest and greatest with their luxurious machines, flavors and more. But, wait! Don't shop without a coupon! Enter the coupon code Gustogift! and receive 20% off of your purchase of a NESCAFÉ Dolce Gusto Coffee Maker! I'm glad to see that you can make other beverages besides coffee on this machine, I would make a lot of Hot Cocoa. would love to have one of these would make those early morning so much more worth it. This would be a wonderful gift for my daughter! She would love to make her own beverages! Thanks for the coupon code! Now I just a new machine! Our Keurig machine died a couple of days ago, and we're so used to a single-cup machine that we need to replace it. But the Keurigs are so expensive! When we're out shopping this weekend, we'll be looking at this as an alternative. Thanks for the review. 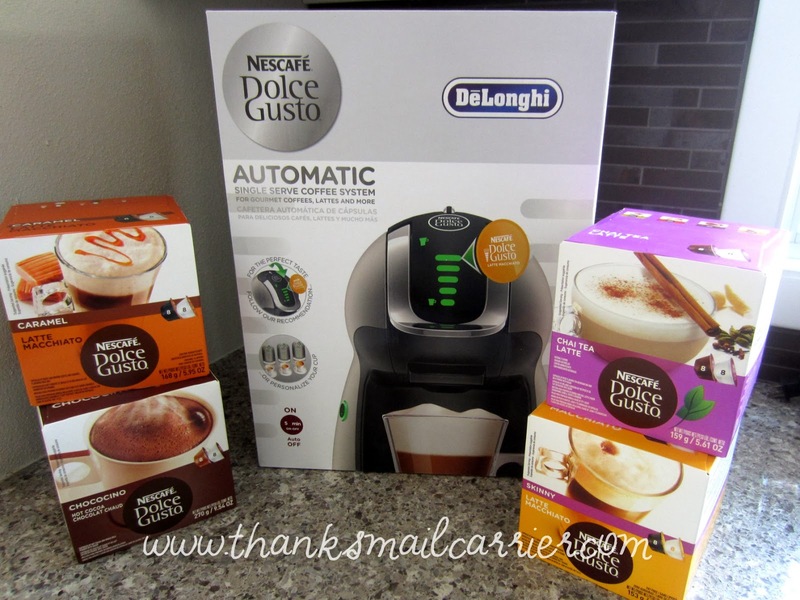 (NESCAFÉ Dolce GustoReview) Would like to have one of these great brewers some day. I have heard that they are really nice.